Douglas Curtis Machine Tools Ltd was founded in 1973 by the late Douglas Curtis and his son Rick, with the proceeds from the sale of their toolmaking company, previously established in 1961. DCMT saw the need for “as new” rebuilding services to users of metal-cutting machine tools. Although market conditions were tough during these years, DCMT’s commitment to quality and customer support enabled it to flourish. It was evident during this decade that besides accuracy and reliability customers needed greater productivity, and advances in industrial control systems offered the opportunity to extend the productivity of existing machines by retrofitting electronic control systems. This in turn facilitated automation of parts handling, and enabled enhancements in quality control using both proprietary and bespoke gauging. During this decade, DCMT was undertaking increasingly ambitious projects demanding design, prototyping, integration with third party equipment, documentation, and post-sales backup in areas including grinding, honing, assembly, and testing. Parts handling grew to become significant, with modularised systems being applied to multiple stages in part manufacture. CMT’s continued machine development programme gave birth to the Vector. The new machine would benefit from these innovations, and aim at a more clearly defined customer base. Suitability for linking into sequential manufacturing cells. The first two ‘Vector’ grinders were sold in 2006 to a customer grinding diesel injector parts. There followed a period of market led application developments, leading to numerous variants in workpiece presentation and holding, and process refinements in respect of grit types, fluids, machine parameters, monitoring strategies and secondary operations. During 2009 CMT succeeded in winning orders for two full production lines, the first Vector based cells incorporating modules from third parties that were integrated by ourselves. In 2013 we sold our first rotary transfer face grinder. The experience gained to-date from over four decades of machine tool design and manufacture has stood us in good stead for future growth, recognising the need to invest internally on new development projects, technology and to attract talented and innovative engineers. We continue to improve and develop the Vector machine according to our customers’ application requirements, both in existing and future market sectors. Curtis Machine Tools Ltd remains constant to Doug and Rick’s guiding philosophy and determination to provide the best products and service. Our proven success within the bespoke engineered machine tools sector is a direct measure of our ability to contribute to the success of our customers. 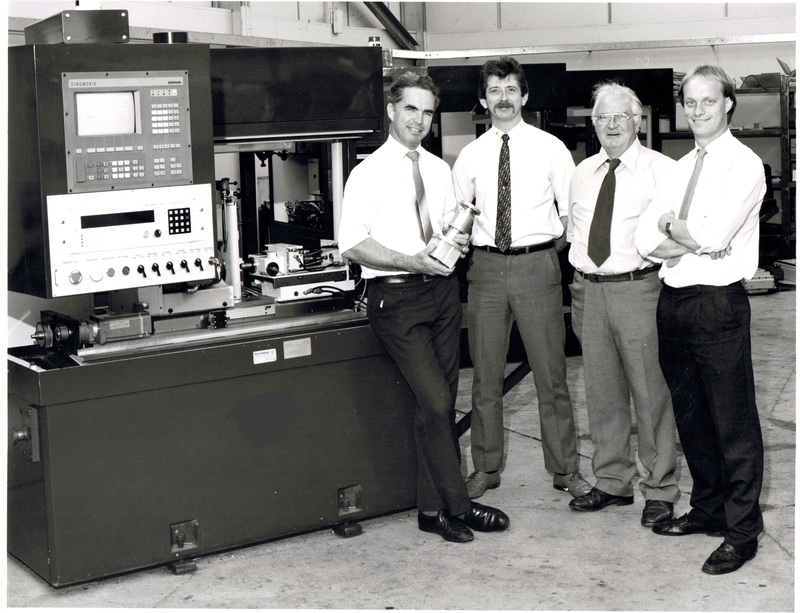 As we were in 1989 : From Left – Rick Curtis (Chairman), Rick Baker (Managing Director of Curtis Assemble and Test Ltd and also Curtis Group Chief Executive Officer), Doug Curtis (Deceased 1999) and Melvyn Boley, (Retired).